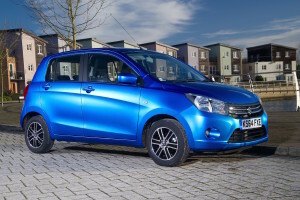 Suzuki claims that the Celerio breaks new ground for city cars by offering more interior and boot space than rivals but with the same compact footprint, and at launch it also lays claim to being the most efficient petrol car on sale, but do either live up to scrutiny? 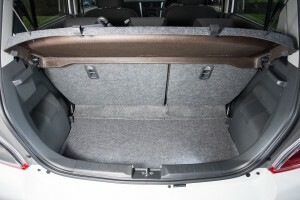 City cars have become increasingly sophisticated, offering many of the creature comforts of bigger cars without the bulk. 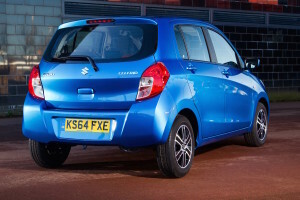 Suzuki reckons that what we really want is a city car that offers more space but without all of the bells and whistles. Are they right? The exterior of the Suzuki Celerio is purely functional with the raised roofline and sawn-off back end providing additional interior space and an unusually large 254-litre boot. The competition has moved the game on compared to the Celerio’s styling. Inside, the trip down memory lane continues, thanks to an equally dated interior which again is very functional but lacks both style and technology. Having manually adjusted the mirrors, a fruitless search for automatic lights, wipers, fancy digital displays, touch sensitive this and that and pretty much any other mod con you care to mention confirms that this a no-nonsense car aimed at the budget end of the market. What it does do is clearly display the information you actually need, with a simple speedometer and a rev counter (thank you Suzuki) and a retro-style red LCD display for trip information, controlled of course by two sticks protruding from the instrument binnacle rather than fancy buttons on the steering wheel. It’s not clever or pretty, but it is actually much quicker to flick through settings and adjust the backlighting than the current fad of having to scroll through endless sub-menus. The highlight on the technical front is the addition of two indirect fuel injectors per cylinder (hence Dualjet) alongside a number of detail changes which include a higher compression ratio and engine start/stop. The result is a modest increase in power but a big jump in the claimed fuel economy. We suspect that many potential buyers will never get past the initial culture shock and will instead be seduced by the competition without even venturing out on a test drive. But are they missing out? They say you should never judge a book by its cover and this is a case in point. Suzuki does know how to produce cars that are entertaining to drive and despite the design team clocking off early, the engineers clearly put in a full shift. There are some niggles, the biggest being that the steering initially strongly self-centres but then gives up a few degrees short which is unsettling and it requires more heft than you would expect at parking speed, whilst the clutch is super-light which feels a bit out of kilter. Night running also reveals that both the dipped and full beam headlights are lacking punch to the extent that it limits progress on unlit roads. Beyond that the picture is actually very rosy. The suspension is very well judged, offering a supple ride which copes well with uneven surfaces whilst still retaining enough body control to maintain composure at higher speeds. 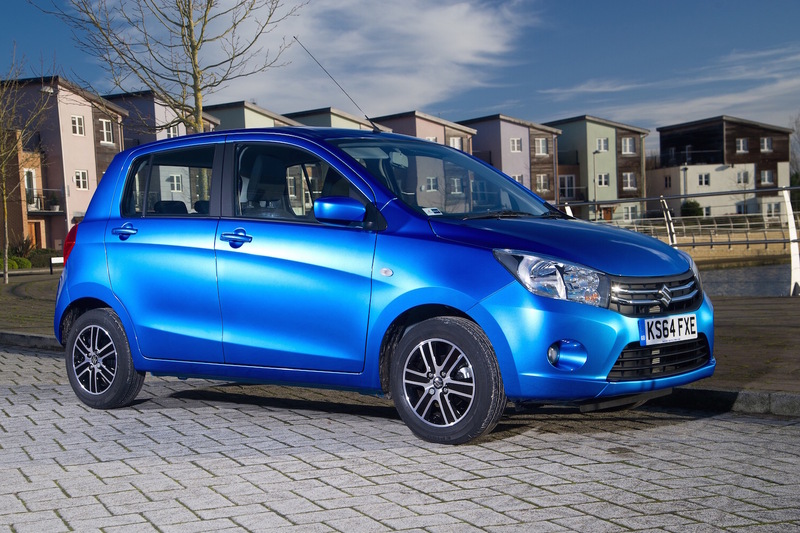 The key to this trick is the extremely low kerb weight which means that whilst the Celerio looks top heavy the suspension actually has very little work to do allowing a soft set-up to be adopted. Above parking speed the steering weighting is also spot-on and transmits enough feel to know what the front wheels are up to. If you do explore the limit, understeer is contained well and traction is near total, even in the wet due to the very modest power and torque available. There’s more good news on the engine and gearbox front. We’re becoming increasingly used to small turbocharged engines but the Suzuki unit shows that normally aspirated engines still have a place. Yes it is down on torque but it revs very freely, has an intuitive delivery which builds all the way to the red line, is easy to modulate, and whilst it does need revs to pull, it will happily sit at as little as 1,400 rpm without feeling laboured. The gearbox deserves a special mention as it’s very slick, allowing super-quick gear changes to keep things on the boil. 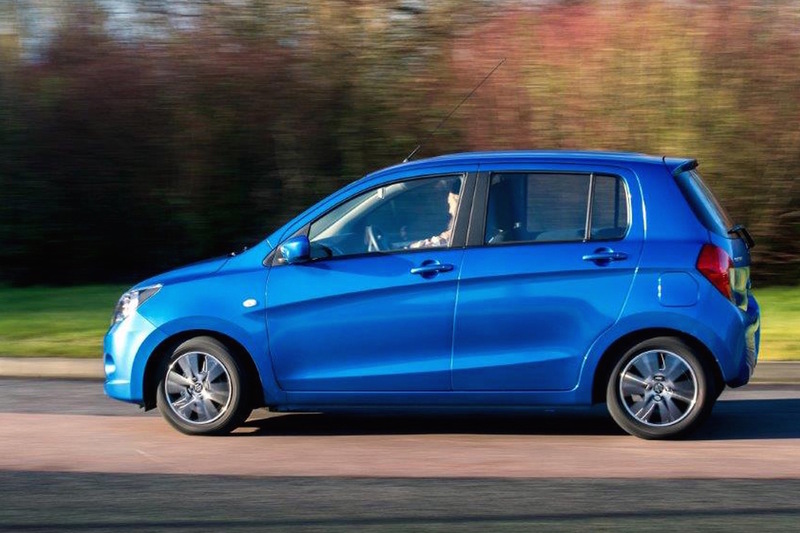 The net result is that the Suzuki Celerio is fun to drive and surprisingly supple at the same time. 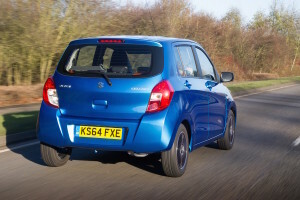 This is where the Suzuki comes into its element, thanks to the revised Dualjet unit and very little weight to drag around, it achieved an incredible 78.4mpg on the official tests, which equates to just 84g/km CO2. Of course excelling on the official tests is one thing, but it is much harder in the real world. 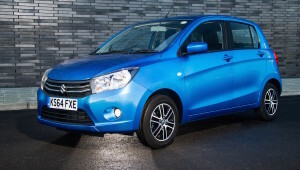 Except the Celerio does very well here too! A mixed urban and motorway route of 10 miles driven carefully returned an excellent 71mpg, helped by the effective stop/start system. At a steady 70mph a long motorway run resulted in a highly creditable 61mpg, whilst tackling the same route at 60mph with some enforced 50mph running gave 72mpg. Fast rolling A-roads, which have a habit of hitting fuel economy, still couldn’t trip up the Suzuki as it returned 61mpg. Without any effort, 60-something mpg is easily achievable, if you’re an eco-champion, over 70mpg is feasible. The Celerio range is mercifully simple with three grades to choose from: SZ2, SZ3 and SZ4. However the Dualjet engine is only available in the middle SZ3 spec so if you want this engine your choices are limited. The cheapest model is a very reasonable £6,999, whilst the SZ4 costs £9,799, with the Dualjet in the middle at £8,499. 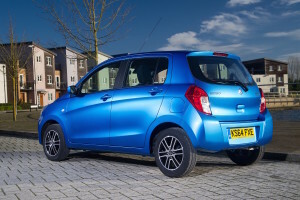 This means that it undercuts key rivals such as the Fiat Panda, VW up!, and our favourite city car, the Renault Twingo. 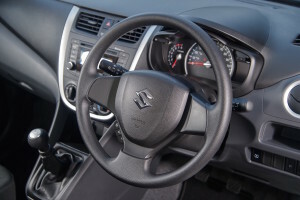 However at this end of the market there isn’t that much difference in price, but the Suzuki does feel like a cut-price offering compared to the established European brands. The specification is limited, but you do get electric front windows, manual air conditioning and a DAB radio which also has a USB socket and CD player. What you don’t get is funky styling, bright colours, or more worryingly, much storage space. The door bins are miserly and it lacks the clever cubbyhole spaces that you get in all the rivals. 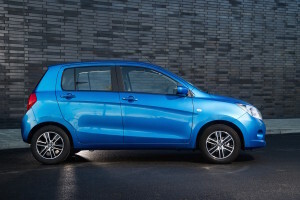 One point to note is that the Suzuki Celerio has a 3 star NCAP crash rating, however that’s based on tests of the lower-spec European model without curtain airbags; that model isn’t available in the UK, so here you’ll get a car with additional airbags. It’s a real shame that Suzuki hasn’t produced European-friendly styling to get buyers into the showroom, as underneath the exterior there’s a good car trying to get out. 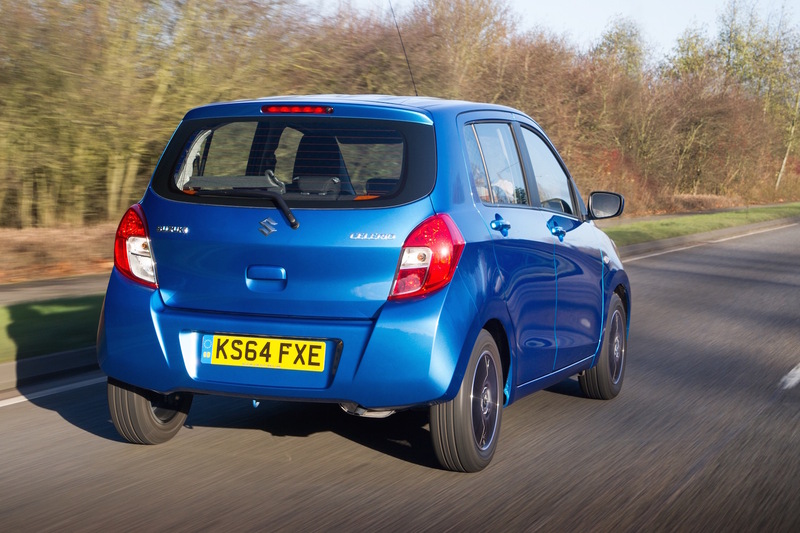 It’s fun to drive, has one of the best gearboxes on the market, and is capable of fantastic fuel economy. It also offers the biggest boot in the class, lots of headroom, and undercuts the competition, but it’s clear where the corners have been cut to keep the price down. Whilst the interior feels like it will last the course, it’s made of hard plastic and it doesn’t look great. If you don’t mind the compromises you will get a fun to drive, affordable city car with a big boot and great fuel economy. However before you sign on the dotted line it’s worth trying the alternatives just to make sure. 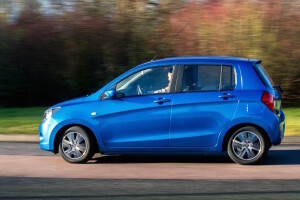 The Suzuki Celerio is awarded a Green Car Guide rating of 7 out of 10.